The healthcare industry’s utilization and adoption of mobile medical carts with laptops have helped to create more efficiency and fewer errors for healthcare providers. 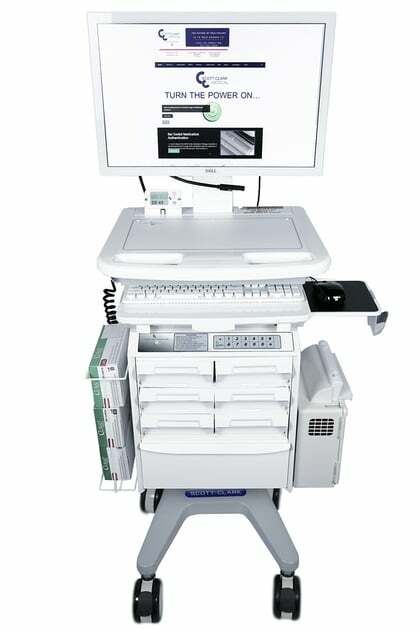 With mobile medical computer carts, nurses and doctors can take their office’s electronic health records with them to each patient. The ability to enter essential data with the patient by the healthcare provider’s side allows the provider to confirm information, discuss discrepancies, interpret data meaningfully, and cut down on costly or potentially dangerous errors. Doctors, nurses, and other healthcare workers used to be tied to the nurses station. The nurses station is where the computers, phones, and patient charts are located. The result was a backlog of people waiting in line for a seat at a computer or phone. Doctors and nurses routinely had to leave patients in their rooms to check on information, tests, or prescriptions. Data was often not entered into the system until several hours later, which led to serious errors because healthcare workers were fatigued or had seen several patients throughout their shift which can blur information together. This process was incredibly inefficient and took vital time away from direct patient care. It also took time away from healthcare providers’ personal lives, especially when they would have to spend an hour or more after their shift just entering data, calling in prescriptions, or tracking down test results. With medical computer carts on wheels, nurses and doctors can take their electronic health records systems (EHRs) with them as they visit each patient individually. The EHRs allow healthcare providers to access patient information on the spot and enter commentary from the patient that may be important to understanding test results and other data. The EHRs also allow doctors to access important test results, such as x-rays and bloodwork and send over prescriptions directly to the patient’s pharmacy. The doctor or nurse can also schedule future exams and tests or send over referrals for specialists. Most importantly, because the healthcare provider can do all of this in one sitting with their patient, their patient feels they are receiving better quality of care. Mobile medical carts with laptops don’t have to be just for laptops; in fact, many are customized with additional equipment, including storage drawers, wristband printers and scanners, and clean inspection equipment. Other carts feature sharps disposal bins, vital signs device holders, and tabletop extensions. 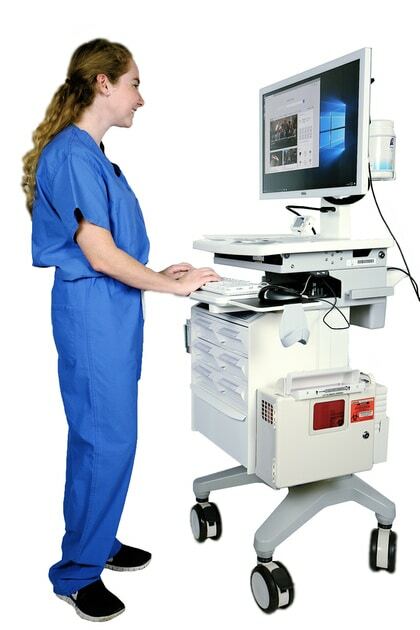 The possibilities for the use of your medical laptop cart on wheels are endless. Carts can also be used to power personal laptops and tablets for healthcare providers who prefer to utilize these tools instead of larger mobile computers. With the long-lasting power system, you never have to worry about finding a place to charge your device. When mobile carts first debuted in the medical environment, they were often criticized for their short-term battery power. The result was healthcare providers scrambling to find a place to plug in their carts and being unable to bring their EHRs with them to the patient’s bedside. Now, most medical carts offer longer-lasting battery systems. Many also offer a hot-swap battery system, which allows a drained battery to quickly be swapped out with a fully-charged battery in less than 30 seconds. This saves the healthcare provider precious time and will enable them to spend more time with their patients. Medical computer carts on wheels are becoming the wave of the future in healthcare. More hospitals and doctors are utilizing mobile computer technology to provide telehealth care, including remote specialist consultations. These carts also provide a unique way to help educate patients, providing important reference materials right at the patient’s bedside. For children, this can include using games and videos to help them understand complicated medical issues.